It’s been three weeks since Prince Harry and Meghan Markle tied the knot, but popular media is still buzzing about the Duke and Duchess of Sussex. An estimated two billion people tuned in worldwide to witness the pair say “I do,” marking their union as the fourth most-watched royal wedding to date. There are over 25 monarchies in the world, so why is everyone so fascinated by the British Royal Family? Let’s explore. People all around the world love fairytales. These magical stories about princes, princesses, and knights represent an idealized reality, and they allow readers to escape into a fantasy. For many, the British Royal Family represents the quintessential fairytale; one that they can follow and live out vicariously. The world is an imperfect place, but the Royal Family consistently presents itself with grace and positivity. A wedding between two people who are young and in love, is a welcome distraction for a world constantly worried about climate change, war, and injustice. Viewers across the globe have been following the Duke and Duchess of Cambridge for almost ten years, and they still tune in for the birth of a new child or other exciting family news. Queen Elizabeth took the throne after her father’s passing at the age of 25, establishing her as the longest-reigning monarch at 92. Since her coronation in 1952, women in the British Royal Family have played a prominent role in the public eye. 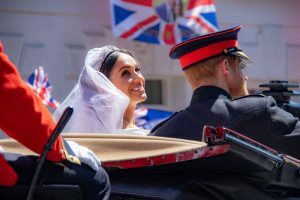 Americans have been obsessed with the British Royal Family long before Meghan Markle announced her engagement. The success of the Netflix series, “The Crown” surprised many of the British creators and actors on the show. According to CNN, just over 29 million people in the US tuned into the royal wedding this past May, even though coverage began in the early hours of the morning. AESU offers several trips to London and the UK, including Cosmopolitan, Euro Spree, Explorer, Euro Focus, and our most popular tour, Great Escape. Explore England and visit Buckingham Palace! This entry was posted on Wednesday, June 6th, 2018	at 10:47 am	. You can follow any responses to this entry through the RSS 2.0	feed. You can skip to the end and leave a response. Pinging is currently not allowed.